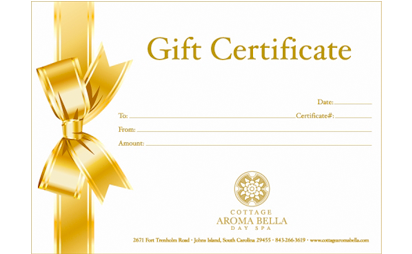 At Cottage Aroma Bella Luxury Day Spa, there is no gift too grand. We are equipped to service individuals, wedding parties, couples, men and children of all shapes and sizes. Our one requirement is that those who visit the World of Aroma Bella are prepared to be truly pampered. Whether you'd like to select a gift from one of our deluxe spa packages, or would like to choose from a plethora of facials, body treatments, manicures & pedicures, and wax & tint services, or perhaps would like for us to help you custom design an experience for someone special, we are here to accommodate your every whim and fancy. Allow us to mail our beautiful Gift Certificate to a very special person anywhere in the United States by simply contacting us directly. You may purchase a printable version online.